This delicious winter warmer was inspired by the onset of winter and the need for some yummy comfort food - the thought of combining some delicious Coltish Pork with figs and fig products I had been making over the last month or so seemed obvious! In a mortar and pestle, pound the fennel seeds, peppercorns and salt to a powder. Cut the pork neck into four even sized, thick slices and season lightly with the spice powder. Heat oil in a large heavy based, ovenproof pan or casserole and fry the slices of pork in two batches, being careful not to overcrowd the pan. Remove from pon and set aside. To the same pan, add the onion, celery and garlic and sauté until the onion is tender. Add the remaining spice powder and stir. Turn up the heat and the fig vinegar and diced fig, stirring to deglaze the pan. Cook until the fig vinegar has reduced by half, then reduce the heat, and stir in the sage. Place the pork in a single layer in the pan, add the stock and bring back to the boil. Cover with the lid and place in the preheated oven for 1½ – 2 hours, or until the meat is tender. When the meat is cooked. Remove it to a plate and cover to keep warm. Skim the fat from the juices in the pan, then place the pan over a medium heat to reduce the sauce to a nice syrupy consistency. Serve hot with steamed greens, creamy mash potato, and if you wish, some grilled fresh figs. If you do not have pork stock, I would suggest using chicken stock. I prefer to purchase the pork neck in the piece and portion it myself, but you could ask your butcher to do this for you. 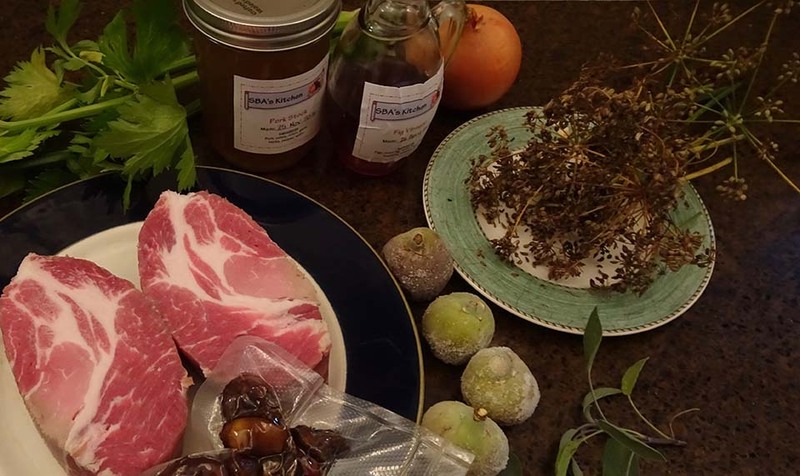 If you do not have fig vinegar, try using a combination of cider vinegar and balsamic vinegar. I love to support our local farmers, so purchase my pork from Coltish Pork. It is wonderful to get to know the producer and become friends with those who are providing such a wonderful quality of product to work with.